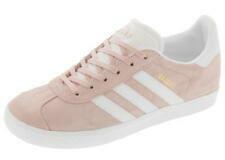 NEW Adidas NEO Women's Raleigh Mid W Sneaker SZ 8 1/2 Gray White Pink Basketball. Shipped WITHOUT box! I• Shoes are Pre Owned and have been Professionally Clean to give you the best shoes we can. What You see in the picture is what your getting! ADIDAS TOP COURT HIGH WOMENS LEATHER DK PURPLE/PINK ORIGINAL 0814 SNEAKER SZ 7 . Condition is Pre-owned. Shipped with USPS Priority Mail. Cushioning in the midsole Rubber outsole enhances traction and durability. WOMENS ADIDAS ORIGINALS EXTABALL RED/ WHITE/ BLACK SNEAKERS SIZE 7.5 - RARE!!! An exotic leopard embossed back panel detail styles basketball-inspired smooth leather constructed high-top sneakers for an urban-chic casual fit. - Round toe with textured bumper - Leather construction - Leopard embossed shaft - Lace-up closure - Textile lined lightly padded insole - Quilted heel counter - Approx. Really nice pair of Hi Top Adidas Neo Cloudfoam Raleigh Basketball Shoes. They are Black and White, Black Patent Leather, and have an Animal Print. The condition is Excellent, easily a 9 out of 10 and shows little to no signs of wear. 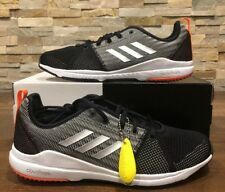 These are brand new with tag Women's ADIDAS Neo VS PACE Black Low Top BASKETBALL Casual Athletic Sneakers / Shoes. - Round toe with bumper - Low top - Perforated, contrast 3-stripe side detail - Lace-up closure - Lightly padded footbed - Back 3-stripe heel pull - Vulcanized rubber outsole - Manmade upper (faux leather) and sole DETAILS : Size : 8 ONLY SERIOUS BIDDERS PLEASE!!!! Happy Bidding!. Shoes are in good condition, but scratches on heels see in pictures. Excellent preowned conditions. **Orders are processed within 2 business days of cleared payment (excludes holidays and weekends). **International Shipping: I use the eBay Global Shipping Program. **Please ask any questions prior to purchase. Questions are usually answered the same day for your convenience. **Items are stored in a pet and smoke free environment. Thanks for shopping in my store! These are brand new without tag Women's ADIDAS NEO Black CLOUDFOAM Memory High Top BASKETBALL Casual Athletic Sneakers / Shoes. - Round toe with bumper - High top - Perforated 3-stripe side detail - Lace-up closure - Cloudfoam memory padded footbed - Silver trim detail - Vulcanized rubber outsole - Manmade upper (faux leather) and sole DETAILS : Size : 10 ONLY SERIOUS BIDDERS PLEASE!!!! Happy Bidding!. Adidas Amberlight Up W Black/Aluminum-Pink G95642 Women's SZ 7.5. Condition is Pre-owned. Shipped with USPS Priority Mail. ADIDAS CRAZY SHADOW 2 Q33394. Dated/Made In 2008. Shoes Have A Few Scuff Marks On The Back (Picture 12). Photos are of the actual item. Size US 5 EUR 37.5. Adidas Athletic Tennis Shoes #0113. Shoes are in overall very good condition. Brand new, no tags though Shipped with USPS Priority Mail. 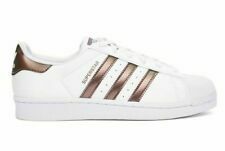 EUC Worn twice, these rare Superstar 80s Metal Toe sneakers in rose gold feature sturdy, gleaming rose gold metal and cream suede upper. Light discoloration at soles consistent with being worn twice, uppers and in excellent condition. Comes with box and original proof of purchase.